If you’re heading to New Orleans before the hot weather sets in (and turns it into a sauna), then Emeril will be in town for a fundraiser for the Culinary Trust, a group that provides scholarships and education for those interested in the culinary arts. The event is produced through the Southern Food and Beverage Museum. Details: April 17; 6:30-9:30 p.m.; The New Orleans Board of Trade building. Cost: $125 for members; $150 for non-members. 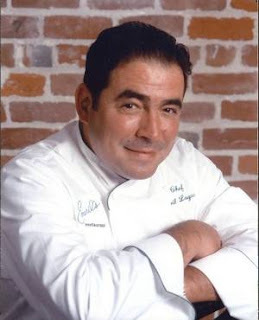 Lagasse – chef, restaurateur, TV personality, author. . . and amateur musician (he received a scholarship to New England Conservatory of Music) – is the headliner. In keeping with the conference theme, Rhythm on a Plate, Lagasse will perform his culinary “jam session” (cooking up and riffing on Creole cuisine) while fellow chefs recruited from around the country, who are also musicians, join him to provide musical accompaniment with high-energy Dixieland and jump-swing sounds. Participants can bid on culinary items during a live auction conducted immediately following the program. And, then enjoy a sampling of southern cuisine and music. A portion of the auction proceeds will benefit the Menu Project, an initiative by the New Orleans Southern Food and Beverage Museum to collect and catalogue current menus from every restaurant in the South (as well as menus from the past) to create a searchable database of the region's culinary heritage. SoFAB Museum curator Elizabeth Pearce will share comments about some of the menus collected and on display during the evening.